Against Central Otago’s extreme climate olive trees flourish producing an extra virgin olive oil with a unique flavor profile. We grow mainly Tuscan varieties including Leccino, Frantoio and Pendolino. 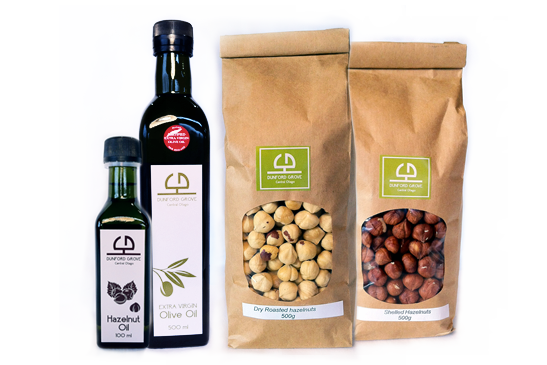 Beside the beautiful shores of Lake Dunstan, Dunford Grove produces premium extra virgin Olive oil and delicious fresh hazelnuts. We practice sustainability in all facets of our business. We are spray-free and compost all our waste including the pomace (olive paste) left from pressing which we truck back to the grove and add to the compost heap. We mulch the smaller prunings straight back on to the ground between the trees and the larger branches from our pruning are turned into Biochar which is returned to the soil along with the compost and seaweed teas. Our aim is to have our soil and trees in the best health possible with zero chemical interference. The result is top quality award winning olive oil. We aim to use everything left from all aspects of the olive growing process. Oil left after racking is used to make our pure olive oil soap an absolute joy for those of us with skin conditions. Remaining branches become firewood in the home fire with the ash added to the compost while the largest branches are turned into olive wood dipping bowls and olive spoons. Dunford Grove Lies on the quiet shores of the unbelievably blue Lake Dunstan. We, Jocelyn Robinson and Sandy Black, moved to this stunning spot in May 2015 just in time for harvest. While the first olive trees were planted in 2005 the remaining 450 olives and 400 hazelnuts were planted in 2007. We grow the Italian varietals Leccino, Frantoio and Pendolino – olives best suited to our southern climate. 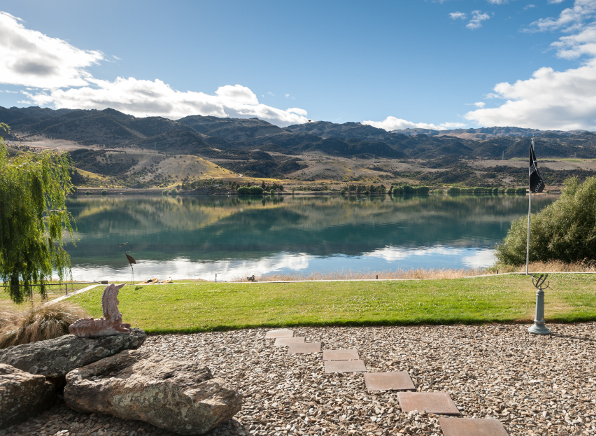 Often likened to a desert, Central Otago’s extreme weather of very cold winters and hot dry summers provide ideal conditions for growing healthy disease-free trees. Because of this, we are able to practice a spray free regime. We welcome your enquiries, comments or questions.